As the Wine & Gold gear up for an eventful offseason, Cavs.com looks back at some impressive facts and stats from the 2018-19 campaign in today’s installment of, "By the Numbers" presented by FanDuel. 83 … season-high in points tallied by the Cavs bench against the Brooklyn Nets on February 13. 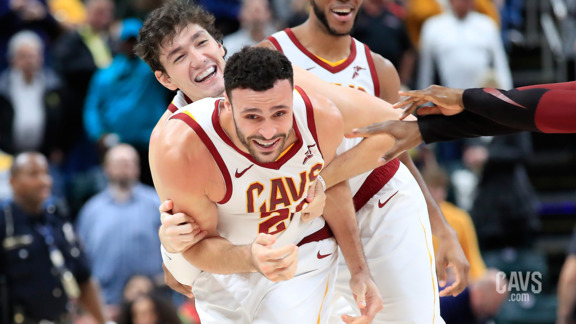 9.4, 8.2, 3.2 … points, rebounds and assists averaged by Larry Nance Jr. this season, all three of which were career-highs. 1,371 … total points accumulated by Collin Sexton in his rookie season - the third most by a Cavs freshman in franchise history. .792 … free-throw percentage posted by the Wine & Gold, which was the seventh best FT% in the NBA this season. 10.9, 10.2 … Tristan Thompson's point and rebound averages - his first season averaging a double-double. 40 … games where the Cavs tied or outrebounded foes this season. They had at least a plus-9 margin on the glass 15 times. 72 … times Jordan Clarkson scored in double digits this season, making him the league leader among bench players. 8-8 … Cleveland's mark from behind the arc in the first quarter against the Pelicans on Jan 9. It was just one trey shy of their franchise record for most in a single quarter (9-9, 11/15/14 vs. Atlanta). 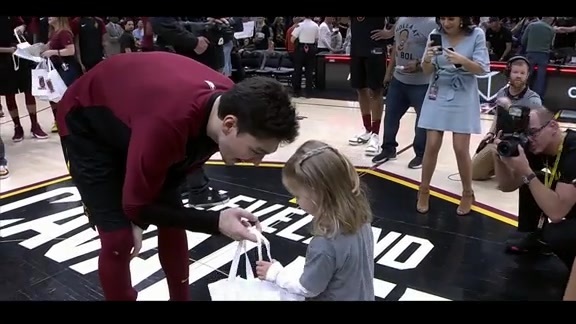 9.1 … increase in points-per-game by Cedi Osman from the 2017-18 Season to the 2018-19 Season (3.9-13.0). 26 … times this season Cleveland had at least six players score in double figures. 2 … games-in-a-row (Mar. 11/12) where Collin Sexton scored 25-plus points without turning the ball over a single time. 139 … points scored during triple-OT at Rocket Mortgage FieldHouse against BKN on February 13. 15+ … rebounds hauled in by T.T. over eight games in 2018-19. 11.5 … three-pointers averaged by the Wine & Gold this season since January 1. 4 … straight games where the Cavs tallied 50-plus bench points, which tied a franchise record from 1991. 2/20/22 … the date of the 2022 NBA All-Star Game, which will be held at Rocket Mortgage FieldHouse after being announced earlier at the beginning of the 2018-19 Season.